I had plans to spend the next four days fshing the Ft. Myers area, and it was part of a much-needed break. I'm a Jersey guy, and superstorm Sandy took everything I've ever owned—from my home on the barrier island in Normandy Beach, New Jersey, to my entire array of fshing gear, photographs, everything. She wiped me of the map. It was fve months since the destruction, and it was high time I got out from under the day-to-day grind of putting the pieces back together. I was tired of dealing with FEMA and living out of hotels day to day. I decided it was a good time to travel, and I reached out to some friends down in Southwest Florida. My plans were a bit loose, but day one with Capt. Rush and Snookie Jig was already turning out to be a muchneeded adventure. As Rush and I broke Redfsh Pass, reentering the backwaters, Snookie Jig regained her intrinsic hunter's ferocity, barking fastidiously at cormorants and such, and good karma was back on our side. A recent red tide had fsh with a case of lockjaw, but Rush had his suspicions to beat the red tide fow and headed to a favorite slough of a local dock, known for harboring snook. "High tide, sun's fnally breaking through, should be some snook of that piling," Rush surmised as he lobbed a live threadfn herring a razor's edge of the piling. Crash, splash and the mad dash—snook on! Not long after, we plucked the circle hook from the under-slung jaw of the 14-lb. heavyweight and slid her back into the tannic water, I was buttoned up, again with a "snuuuuk" as the local dialect call them in Southwest Florida, and promptly released a feisty eight-pounder. The tide began to move again, the bite turned of, and we decided to work the mangrove shoreline with poppers, toying Above: Young snook are repopulating the Ft. Myers waters—a positive sign with one shoulder-driven, 10-lb. jack crevelle after another, testing the drags out and stocks are on the rebound. Drag-ripping jack crevelles get the attention of all putting a ftting ending to a fun-flled day. aboard, including the dogs. The Ft. Myers area encompasses the Captiva/Sanibel/Pine Island playground. It's world-renown for incomparable snook, redfsh and tarpon fshing. 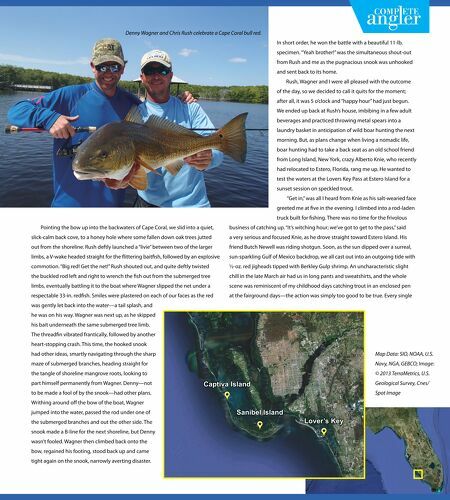 Names like Redfsh Pass, Boca Grande, and Pine Island Sound send shivers down the spine of any dedicated angler with the dreams of targeting the fsh of a lifetime, whether casting a live-baited threadfn or a precisely-dropped shrimp fy. It ofers some of the best inshore action along the Gulf Coast, and that's saying something. I wanted to fsh as much of it as I could. The next morning, we changed the game plan. I dialed up my good friend Denny Wagner to join me and Rush. Wagner is a salty brother who previously held the position of engineer on the vessel Ocean of the television show Shark Men. We all met up and then put the throttle down on Rush's 19-ft. Ranger skif, this time to navigate the winding upper creek channels of Pine Island Sound in an attempt to strategically avoid the red tide conditions. Underneath mangrove roots of the creeks, rat packs of baby snook of 14 to 20 inches stacked up, a warming sight to see after the big freeze of 2010 that killed of an enormous chunk of the snook population in Florida. All three of us stood in awe of the prolifc amounts of diminutive snook pooling up at nearly every mangrove cutout, a true testament to the rebounding ability of a species if stocks are allowed to rebuild in dire times. "Let's get outta here and leave these kids be, and head up to tuck into a sweet spot, where I've got a feeling there might be some bigger snook and reds around," suggested Rush.